Lil' Miss Colour Hair and Beauty salon raised £1629.50 and divided the money between P.I.PS Newry and Mourne and Donard School Banbridge. Fundraising Started in salon and sponsor sheet with friends. Saturday 24th August the girls in salon all dressed up and then on 4th anniversary of Lil miss Colour climbed Slieve Donard on Sunday 1st September. This day there was an amazing 50 people doing and helping with the walk. Salon girls Jayne Mcknight, Lindsey Bickerstaff, Sammy Hamilton, Aideen Colgan, Laura McIness, Laura McCracken and Kelly Scott, Followed with everyone who took part on the day and got to the top for their own personal achievement . Marty Lennon, David Boston, Lisa Megaw, Simon Megaw, Laura Bordessa, Steven Bordessa, Jillian Mcmurray, Michelle Carr, Laura McConville, John O'Neill, Joanne Moffett, Jane Moffett, Colm Mcavoy, Milo Lennon, Patricia Lennon, David Watson, Sara Watson, Carol Simmons, James Moorhead, Zara Lyttle, Roberta Simmons, Cori Jennings, Christine Mckinstry, Gareth Mckinstry, Leah Hilditch, Paul Parks, Colin Mcgarth, Audrey McIness, Sam McIness, Robyn Kerr, Jenny Gilmour, Lisa Moorhead, Caroline Kennedy, Patrina Cheaveaux, Steven Lennon, Margaret Lennon and Derek Kennedy. Sharon Weir, Liz Hudson and team for first Aid, thankfully not needed. Kathy Dawson, Samuel Kerr and team for their Experienced Walking to help out. Jayne would like to thank everyone who helped raise money and who donated, and for everyone that took time to come and climb Slieve Donard. 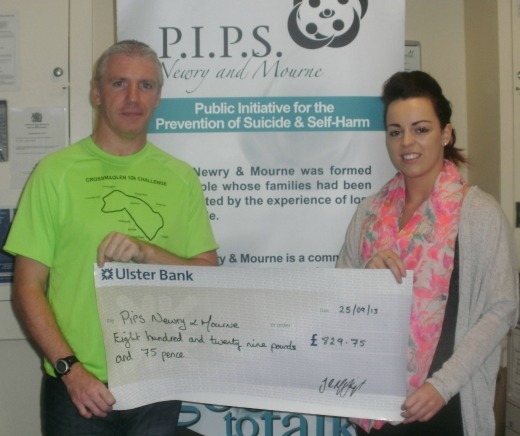 Thank you to everyone from PIPS Newry and Mourne for your fantastic support for suicide prevention, awareness and support services in Newry & Mourne.